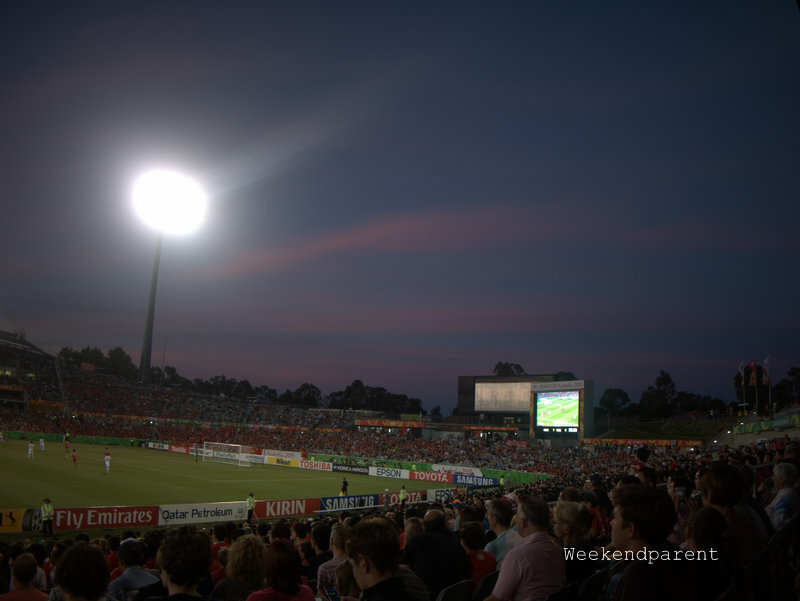 With more than 1 billion people estimated to be watching the AFC Asian Cup matches in Australia, including the exciting final between Australia and the Republic of Korea this evening, I recall a tale of what might have been: a match between China and North Korea, which ultimately had an impact on one of the deciding matches that Australia played. So who would you barrack for? China or North Korea? 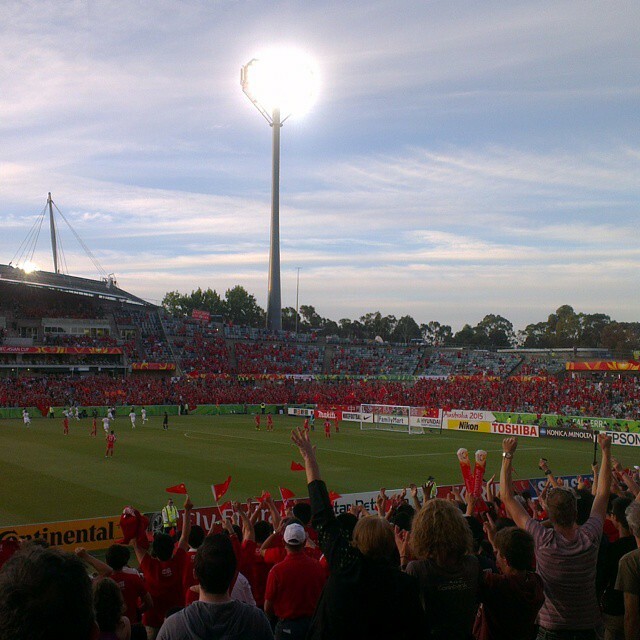 Judging by the sea of red, most of the supporters at the 18 January match in Canberra were China supporters. 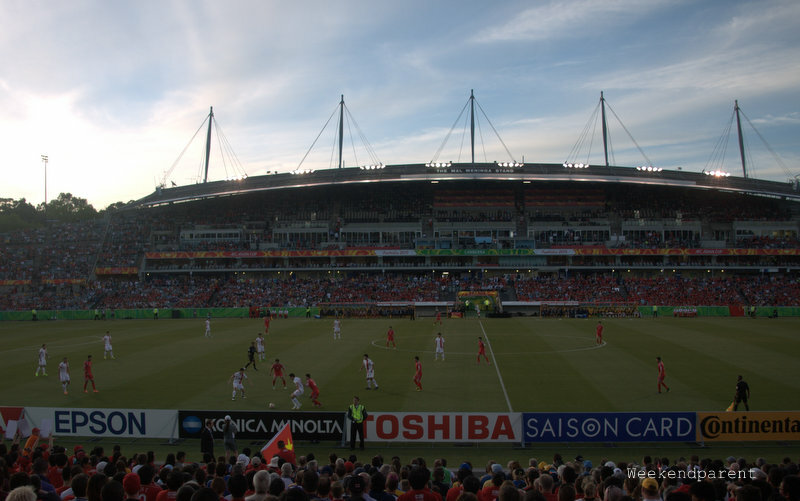 In fact, it was hard to find ANY North Korean supporters in the 18,457 strong crowd. They must have been lurking there somewhere, but the view was overwhelmingly red. Even my Dad got into the act. There was a reason for so many red Go China! 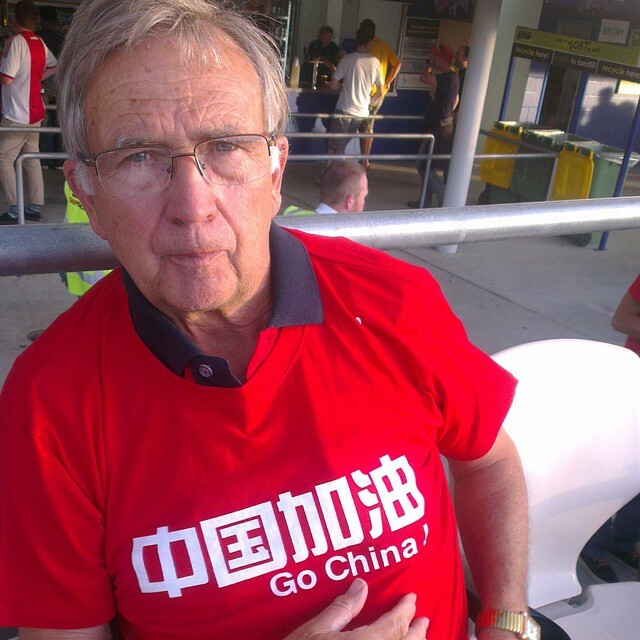 (中国加油) shirt-wearing supporters: they were being distributed for free by Hengda, a Chinese company. My Dad scored the very last free red T-shirt being handed out – luckily for him it was XXL, which is perhaps why there were no other takers. The match was totally sold out. 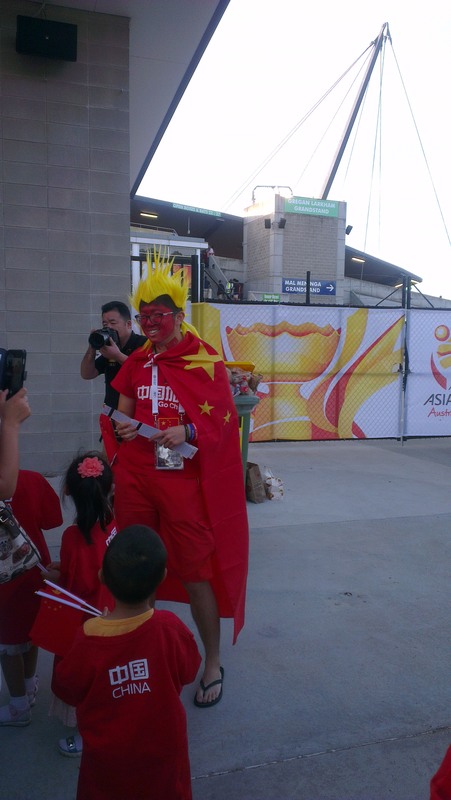 But this keen China supporter was standing at the entrance desperately trying to GIVE AWAY free tickets. 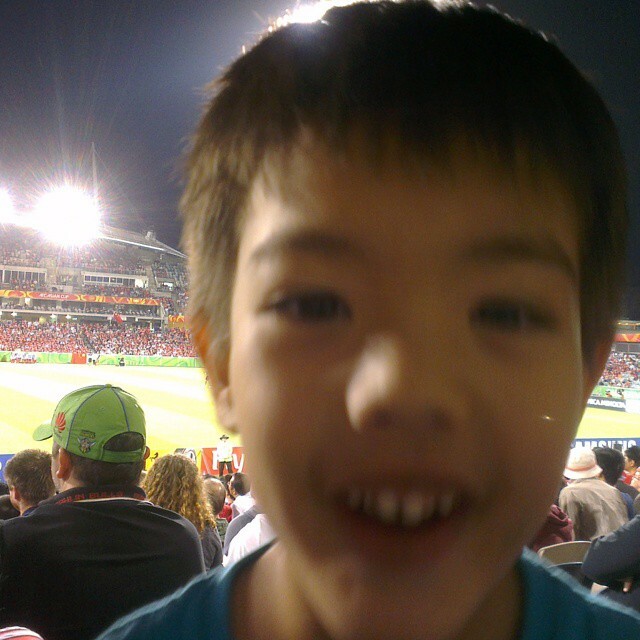 I took Big A with us to the match (Little A is still a bit too young). He was so excited, but also a bit overwhelmed by all the people. Less than two minutes in, China scored its first goal. It was a bit confusing, as the Chinese team was wearing white with red lettering and at first some of us (myself included) were not sure who had won. 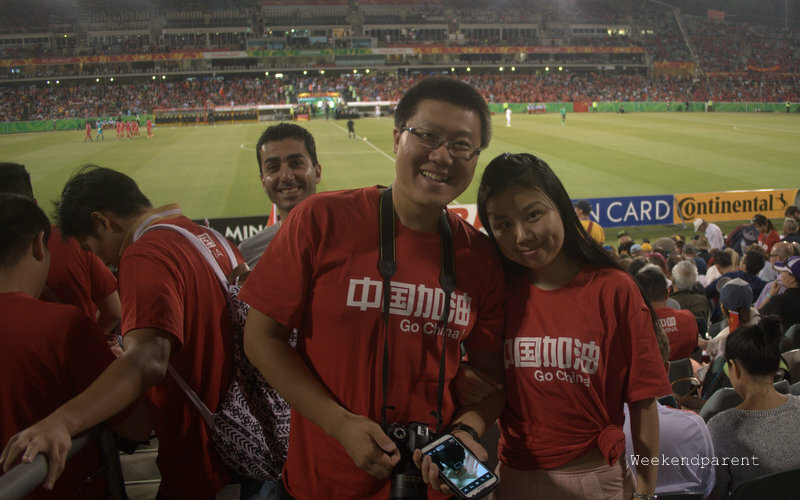 But the sea of support from the red-shirt wearing Chinese players helped to give me a hint. Around twenty minutes later, China scored its second goal, and the crowd went wild again. The China team now seemed quite sure of themselves, and looked almost casual. Perhaps they were saving themselves for the later match against Australia. Still some good footwork, but not too much exertion. But then, after half time a different North Korean team emerged. The DPRK was mostly the same in terms of players, but boy had their attitude changed. What kind of pep talk had they received in the locker room? Was it all about the power of achieving and visualization? Or was it more sinister, and perhaps related to threats of themselves and loved ones back home? The North Korean team kept the pressure up, with at least three good attempts at a goal. The ball was now more often in their camp, and it put pressure on the Chinese side to up their performance. And they certainly did. China and North Korea might have a strange political friendship, but on the soccer field there are only winners and both played to win. 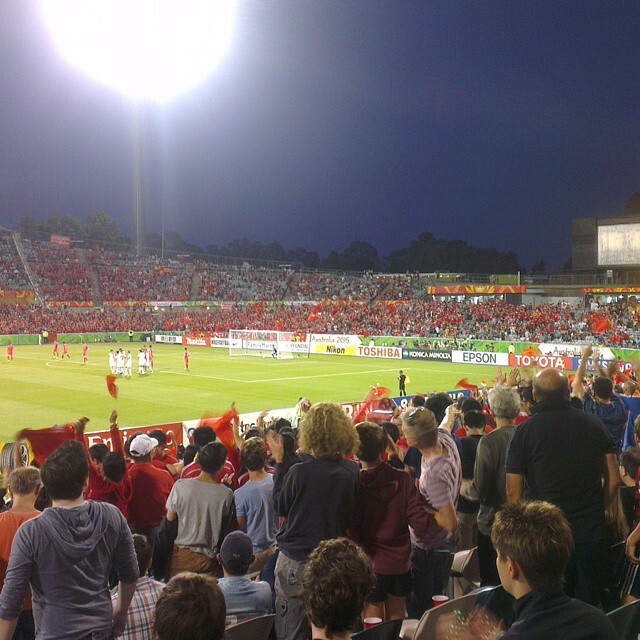 But in the end, it was China who won 2-1, going on later to play (and lose) to Australia. Big A was tired, so we left around 15 minutes early and managed to get on the first ACTION bus back to Belconnen. I wondered how many of the other young children were coping with the late Sunday night match: it was almost like a family reunion, with many Chinese families bringing their whole family along. I enjoying meeting this devoted nai nai (Grandmother) and her cute granddaughter. We were glad that we took an ACTION bus to the event. The bus dropped us right off at the entrance, which is lucky as Big A has mild cerebral palsy and gets tired walking long distances. Coming back we also only had to board the first bus near the entrance. 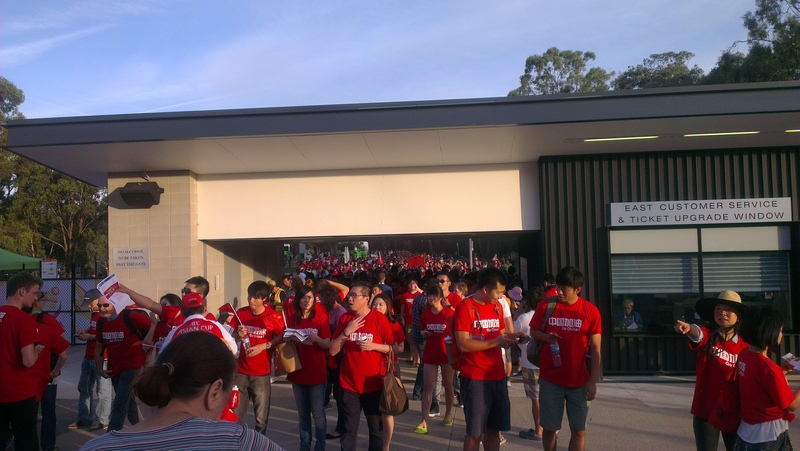 But moving a 18,457 crowd is not easy, and our bus was stuck in traffic for nearly half an hour. I wondered that there was not better access for buses, given they are the only form of public transport to and from Canberra Stadium. So, Big A loved his first ever soccer match and had plenty of stories to tell his friends at childcare the next day. And my Dad still wears his Go China! shirt. All up a good night out. Thanks shenANNAgans. They were fun events, weren’t they. Just the vibe of being there was pretty cool.